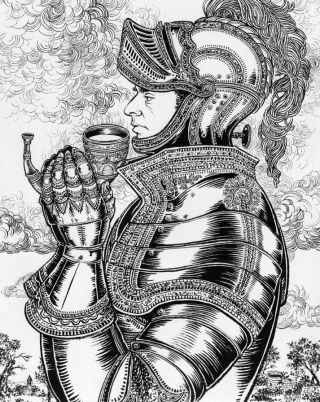 +$This award-winning artist has been sharing ink drawing tips. +$How're you coping with the daily demands of the Inktober? The challenge, which asks for artists to create ink drawings every day throughout October, is a popular task amongst illustrators. However, many people can find the medium and the pace of the challenge difficult. +$To help artists power through Inktober and make sure they get the most out of the medium, award-winning illustrator Yuko Shimizu has been sharing tips for如何绘制+$in ink on her Instagram page. +$"For me, doing this as a career, I ink pretty much every day of the year," Shimizu tells Creative Bloq. "But for the rest of us, it’s a great excuse and incentive to enjoy, and get better at the craft. It’s something you have to put time in, but when you are having fun, the learning process is not daunting. More power to Inktober!" +$We've rounded up five of Shimizu's ink drawing tips below, but be sure to+$follow her on Instagram+$for more illustration advice as the month progresses. Or, if you're after more guidance, take a look at our+$7 tips for smashing Inktober 2017. +$Shimizu's first piece of advice for ink drawing is to hold fire on the inking itself. Instead, she recommends that artists put down an underdrawing to provide a basis for their work. +$"I find HB the best pencil for the purpose," she reveals on Instagram. "Anything harder than HB may leave scratch marks even after erasing, and anything softer would be easier to draw but harder to erase out completely and often leaves dark marks." +$If it's taking a while to create a sketch you're happy with, Shimizu suggests drawing on a separate piece of paper and only tracing over what's necessary onto a fresh sheet with the help of a light box. +$"This way, the underdrawing is light and clean, makes it easier to see the ink lines you are making, and easier to erase the underdrawing completely," she adds. +$Seasoned veterans of ink drawing are sure to be familiar with this tip, but you're never so experienced you can't benefit from brushing up on the basics. By working from left to right, artists can prevent wet ink from smudging and create beautiful, crisp illustrations. +$While this tip is aimed at right handers, it can be easily adjusted for left handers, too. "If you are a lefty, move the other way around," says Shimizu. "This way, you have less chance of making an inky mess on your paper." +$This tip is a follow-up to Shimizu's first piece of advice about underdrawing. "f you have pretty advanced drawing skill, my advice is to go as loose as possible on underdrawing, and let the inking stage figure out each line you are putting down," she explains. "This makes the final ink drawing have a lot more energy and motion. The less you trace, the more energetic the result becomes." +$But what happens if you make a mistake when you're drawing? Don't worry, small errors can be worked out later, says Shimizu. "Move on, and revisit after the drawing is done, then you know your mistake is not that big of a deal," she says. "Some artists prefer perfection, but it is also true that it’s more charming when something is slightly off and imperfect." +$Let's say you do make a big mistake, though, what should you do then? It's hard, but Shimizu recommends that you take the plunge and start over from scratch. +$On Twitter she demonstrated how this can improve your work by posting two versions of a similar image. The one on the left is the one that worked, while the one on the right was thrown away. +$"I liked how the faces and hair turned out, but I wanted all the kids to be wrapped in one scarf, and the wrap flow didn’t quite work," she said on Instagram. "I kept trying to fix it, but at some point, I had to give up. This was a tight deadline, and I honestly didn’t have much time to waste. I would have loved it if I didn't have to start over. But then, when things don’t work, they really don’t work. I just have to give up." +$When it came to the second attempt, though, Shimizu found the inking process much faster and smoother. This is because she already knew what wouldn't work, and how to fix any mistakes along the way. +$"Even the facial features that already worked in the first one, the second one worked even better!" she says. "So, don’t get scared of starting over. It’s a good thing!" +$For a complete look at how Shimizu works, be sure to watch her+$Ink Drawing Techniques video+$series on Skillshare. In these videos you'll see how to select the best materials, as well as finding advice on how to work with textures, different types of nibs and paper. +$The series is made up of 14 videos that total over an hour of footage, so there's plenty to dig into and enjoy. Not only that, but until 13 October, the series can be yours to watch for absolutely free. You will have to sign up to Skillshare, but watching the videos won't cost you a penny. +$This is a rare chance to catch the advice of a master illustrator for nothing, so be sure not to miss it!